Now it’s time to send your first message! Later on, we will also show you how to send messages via other channels. Let’s begin! On the Campaigns page, click the Create campaign button. Enter a name for your campaign and click Next. Now you can start building your test message. 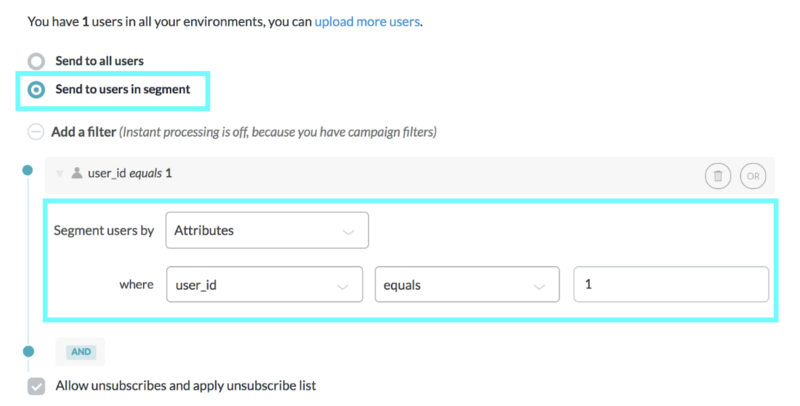 For this campaign’s segmentation, check the “send to users in segment” radio button. Let’s add an attribute filter here. By selecting user_id equals 1, we can now be sure that this test message will only be sent to your user on your development environment. If you do not add this filter, the test message will be sent to all users on your development environment. For the second section, let’s select an email variant. Note: The Use Source Code option is available if you already have code for the email templates you want to use. For the source code option, simply copy and paste any HTML emails you have built into the source code editor. If there are merge tags from other tools, like Mailchimp, make sure to replace those with Connect variables. 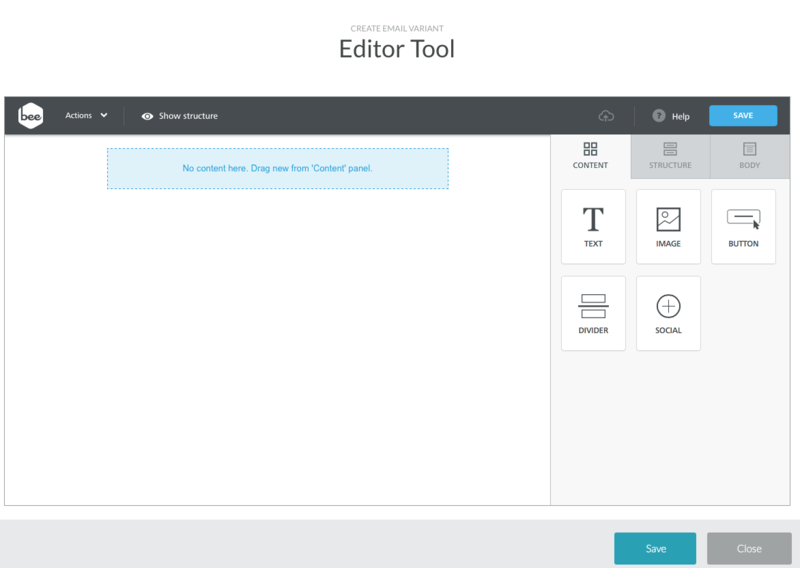 Use the drag-and-drop editor to build your test email. Drag Structures into the email body on the left. Then add Content to add text, social buttons, pictures, etc. Tip: To use variables in your message, type the @ symbol in the message. Try adding the first_name attribute to your message. Click the Save button and wait until it saves to our server. Once it says it’s successful, click the Close button. Last but not least, add a Subject for your email. 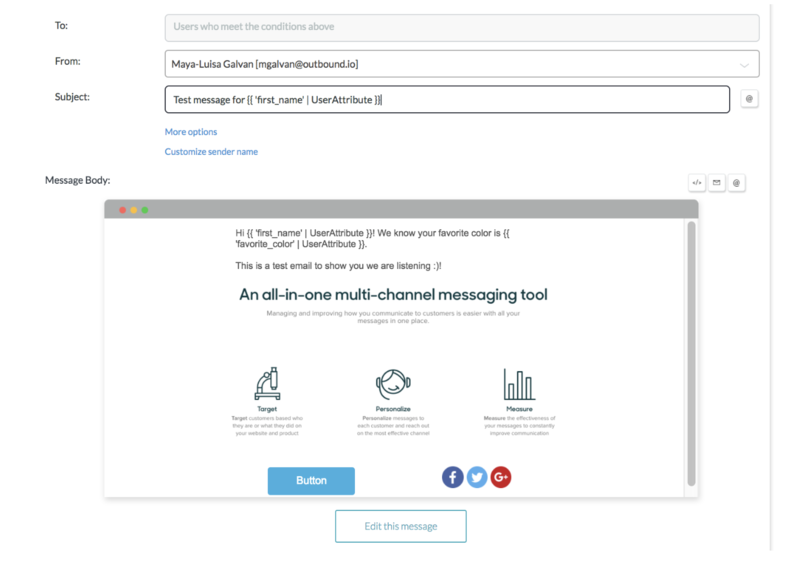 Connect will automatically track opens and clicks for your email message. You can leave this section blank as goals require the the API integration path . Click Save Draft & Preview to continue. After finishing the steps in Adding message content, make sure to save your campaign by clicking the Save Draft and Preview button. If this button is not available on your account, please contact connect-sales@zendesk.com. Once you click this button, you should receive an email containing the broadcast campaign. Note: We will explain “Dry run: Production” and “Final send: Production” in later sections so don’t worry about those just yet. Congratulations! You just send your first message with Connect! You can also visit your user’s profile and click on the messages tab to see the message that was delivered. Additionally, a CSV will appear on the campaign management page. This CSV contains a list of every user in your account, as well as who was messaged in the test. Don’t see an email? Contact connect@zendesk.com and we can help figure out why! Return to 1.2: Checking your test user profiles , or continue on to 1.4: Importing real users .